‘Supposing it didn’t, said Pooh after careful thought. I hope you’ve not had too many political conversations over dinner (unless maybe that’s your family’s thing) and are rested enough to finish the semester strong. We have a big three weeks(ish) ahead of us and then (finally) we come to the purest form of the holiday season: a whole month without academic responsibility. -Food for Thought Discussion- VITAL, Room 207, 11:30-12:45 p.m.
-Theology & Religious Studies: Faith & Culture, Room 204, 5:00-6:30 p.m.
-Agape Latte, First Floor Lounge, 8:00-9:00 p.m.
-ACS Writing Awards Reception, Speaker’s Corner, 3:30-5:00 p.m. However, none of these options felt right for this week’s #MindfulnessMonday. So that is my suggestion to you all this week in case you were in need of an insightful, contemplative, inspiring, unique read this week. In this difficult time we at Falvey Library want to remind students that Safe Zone volunteers offer a place that any student can come to seek solace or refuge. No appointment necessary. No questions asked. 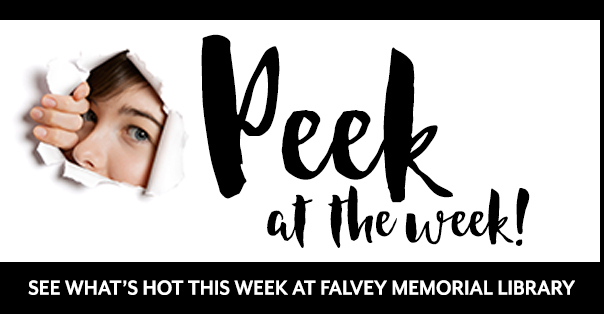 #FalveyPeek at the Week provided by Hunter Vay Houtzer, a graduate assistant on the Communications and Marketing Team at the Falvey Memorial Library. She is working toward an MA in Communication at Villanova University, and on winter-wardrobe preparations. Send your thoughts/suggestions to Hunter at #falveypeek. See you next Monday for more!